Abby has a home! 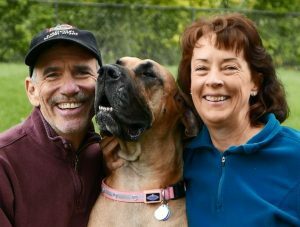 - Rocky Mountain Great Dane Rescue, Inc.
Abby has found her forever home in Lakewood, CO with her foster family Lori and Ray. After nursing her through numerous health issues over the past 4 months, they just could not let her go. Abby is finally feeling well enough to play and has settled in to stay. Both Lori and Ray have loads of Dane experience and work from home so she will be under their watchful eyes and seldom be left alone. Way to go Abby!